Once you try a rollator you will never go back to a regular walker. No more glides wearing out, you will no longer have to pick up your walker legs to go over the edges of rugs and carpets! 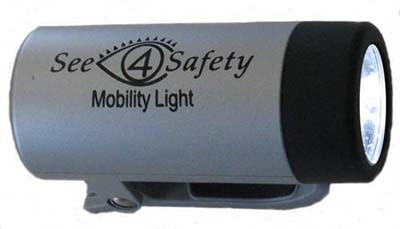 The rollator is constructed of a strong but lightweight aluminum frame. The aluminum is welded at every joint throughout the walker. It features adjustable height handle bars, loop brakes and six inch wheels. This lightweight rollator is easy to maneuver, easy to transport and easy on the budget! It is also a very secure "footed" walker. Try as we might, we were not able to push the handle grips down and have the walker "go out in front" causing a fall. The walker stays in place and is balanced perfectly. All four of the walker wheels are 6 inches in diameter with polyurethane tires. The handle bar grips are ergonomically designed which comfortably fits the palm of your hand. This extra touch on the hand grip makes walking and braking far more comfortable than just a normal grip. The handle bars are height adjustable from 32.5inches to 37 inches. The easy squeeze loop brake system is directly under the handle bar grips exactly like a geared bicycle. 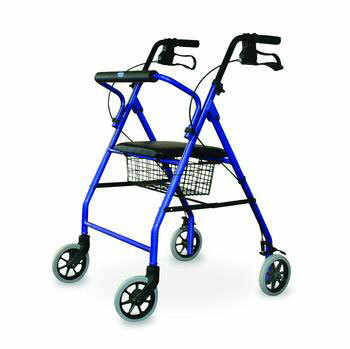 The brakes will give you a very firm, secure feel to your walker. You will never feel as if your walker will go out in front of you without you being in control. One great advantage of this walker over some other loop braked walkers is the forward alignment of the "loop" on this walker. 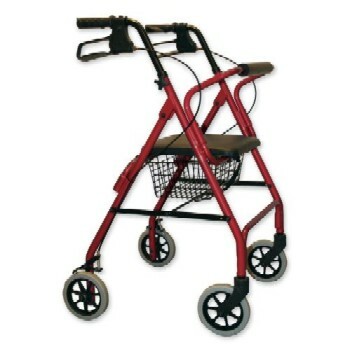 Many times, the loop becomes caught in things as it rolls by; you won't have that problem with this walker. The Soft Seat Lightweight Rollator has a soft cushioned seat for added comfort. The seat height is 21.5 inches high. The storage basket sits under the seat and is easy to remove when desired. This rollator folds easily for transport and storage. Available in blue, burgundy, green and black. It weighs only 12.5 lbs and has a weight capacity of 250 lbs. Warranty: three years against manufacturer's defects.